1. The combination of mic and recorder is often more important than either component by itself. You can have the greatest mic in the world, but you won’t get a good recording if it’s connected to a crappy recorder. The converse is true too, but more to the point, some recorders just seem to work better with certain mics. For instance, MOST of the new, affordable, small flash recorders do not have particularly great mic preamps in them. Mic preamps boost up the very low-energy signal generated by microphones to a level that can be better recorded. Those inexpensive recorders usually have mic preamps that tend to sound noisy when used with low-output microphones, especially dynamic mics. You can get cleaner recordings with high-output mics, such as condenser mics, because you don’t need to crank the preamps up as much. But a recorder with good clean preamps that can add a lot of gain can sound good with a wide variety of microphones. Newer Zoom recorders, such as the H5 and H6, and F4 and F8, have preamps that are much better than the earlier Zoom recorders. The Tascam DR-60DmkII, DR-70D, and DR-100mkIII (ESPECIALLY the DR-100mkIII) all have powerful-enough preamps that almost any mic will sound pretty good. And the Sound Devices MixPre3 and MixPre6 have excellent preamps, and are compatible with any microphone. 2. There’s no one mic that’s perfect for all situations. 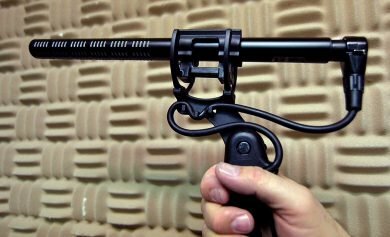 Most of us have developed a preference for a certain kind of sound: the up-close, intimate sound of a cardioid or shotgun mic placed close-in; or the more open, ambient, in-the-room sound of an omni mic. 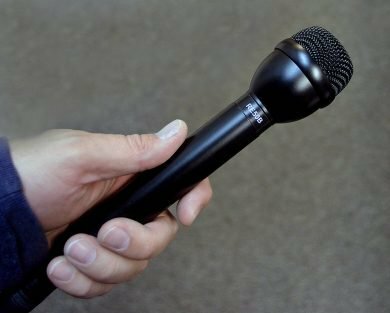 That preference (or unconscious habit) may determine your first-choice mic for interviewing when you can control the circumstances, but when the situation changes, your gear choices might need to as well. If you’re outside, in a breeze, that shotgun mic may not be useable due to wind rumble. If your subjects might move around so much that you can’t keep them on-mic, an omni can give you a much more consistent sound. Even if you prefer the sound of an omni, if you’re stuck recording in a noisy space, you may need the tighter focus of a more directional mic. The real answer is to have more than one mic in your kit… That said, it’s not uncommon for radio producers to use a shotgun mic almost exclusively, and it might be just as common to see only an omni mic, such as the RE-50, in a reporter’s bag. 3. Search around for reviews, or even better, try out some different recorders and mics if you have access to them. Try to check out a few different options at a radio station, or a school, or training facility, or via friends, or if you’re lucky, at a store that can actually demo things. It helps to hold the gear in your hands: some people really like the ergonomics of a recorder that can be hung over your shoulder, leaving your hands free. The Marantz 661, Tascam DR-60DmkII, Tascam DR-70D,, and MixPre3 or MixPre6 are built to use hanging from a strap, or in a gear bag. The meters are still easily readable from that position, and the input gain is easily reached. Others find those same machines way too large and clunky. Some people really like keeping the recorder in their hand; others find it too heavy… etc. 4. A condenser mic that has an internal battery will give you the most flexibility. You can use that kind of mic with recorders that only have a mini-jack mic input, as well as those that have XLR inputs. You’ll get slightly better sound quality if you use a recorder’s phantom power, but that reduces the recorder’s battery life, so you might want to opt for using the internal battery in the mic and switching off the recorder’s phantom power if you need long record times on battery power. Keep in mind that some condenser mics do not include the option for self-powering via an internal battery, and those mics cannot be used with recorders that only have a mini mic input (at least not without some external source of phantom power). In rough generalities, Dynamic mics are more durable, handle very loud sounds better, do not require phantom power, and will perform better in challenging environments (cold, hot, damp) than condenser mics. But in general, they have lower-level outputs, so, as mentioned above, you might get hissy sound with many of the little inexpensive recorders. Dynamic omni mics, such as the ElectroVoice RE-50, the EV 635, and the Beyer M-58, are especially low-output, and will be noisy with some field recorders. There are a few recorders that can use low-output dynamic mics and still sound good: The Sound devices MixPre3 and MixPre6 recorders and the Tascam DR-100mkIII are especially versatile. You can get decent results with dynamic mics with some other recorders, but most still sound better with condenser mics. If you like an omni mic, the industry standard favorites are the EV RE-50, or EV 635, or the Beyer M58, but remember, those are all dynamic mics and are only good choices with certain recorders, as noted above. If you need a condenser mic, the Beyer MCE-58 has long been a good choice, but it’s expensive (almost $400.) For a more affordable mic, we like the Audio Technica AT 8010, which sells for closer to $150. For a directional mic, we like short shotgun mics, especially the Audio Technica AT-897 and The Rode NTG-2, which cost between $200 and $300, and the industry-standard Sennheiser ME66/K6 combo, which costs approximately $450. Cardioid mics, which still focus mostly on what’s in front of the mic, but are not AS directional as a shotgun, are very natural-sounding interview mics. The Shure SM-58 is a classic voice mic, and quite affordable (about $100) but as a dynamic mic, needs a required with good preamps. There are many similar dynamic cardioid mics, most designed for singers, but that can also be used for conversational voice recording. Condenser cardioid mics tend to be more expensive, and there are not many that can use an internal battery, so you’ll have to provide phantom power from the recorder (via the XLR mic cable) but these can be excellent tools. The Shure Beta 87A is a solid choice, and on the expensive end, the Neumann KMS 104 is a favorite. In the end, results are greatly influenced by circumstance and technique and personal taste. If you’re recording loud things, many of these distinctions won’t matter. If you’re doing breaking news, your editor won’t care about a little hiss, as long as you can hear what the interviewee said. But if you are doing more extended documentary work, where the listener has time to focus on the subtleties of the voices, it’s certainly worth trying to avoid distractions like hiss, rumble and distortion. Picking the right combination of mic and recorder can go a long way toward reducing those problems. along with links to purchasing the equipment, and some other thoughts about what we think are good, better and best choices in recording rigs. Jeff, thanks for the overview. I’m looking forward to reading your opinion and comments about the recently-released Olympus LS-100. Full review coming soon, but the short version is: I hate it. Seriously. I remain a big fan of the LS-10, so I had high hopes, but they did lots of things wrong here… It’s overly complicated to use, but the biggest fault is that it has an internal, non-swappable rechargeable battery. I don’t like that aspect of my iPhone, and I certainly don’t like it on a field recorder either! I really need to be able to swap-in fresh batteries in an emergency, it doesn’t matter how well you plan ahead, sometimes you need more record time than you anticipated. More details to follow in a full review, but I am very disappointed in the LS-100. Got a question. I saw your review for the Sony PCM-M10 and I loved the result. I’ve had a Zoom H2 and the noise floor is bad with the built in mics. I was shocked at how quiet the ones in the PCM-M10 are. Now, apparently, this model is discontinued. Any for sale on third party sites are way more expensive than the original price. I’ve not seen one for under $400. Do you have any ideas as to where I might find one cheaper? Or, maybe there’s a new model equally as good? Noise floor is a biggie with me. Maybe this is a new thread but this is the first place I landed. Thanks so much. Gosh, another great nugget from Towne. It comes at a good time as I’m looking for a higher-output standup field mic for an DR-100 (preamps not what they are on the newer MkII). Now, I’d rather not buy from Amazon or Guitar Center, so I go t my local Hollywood’s industry-serving sound place, Ametron (on Argyle in LA). But it is difficult it is to get good info. The Ametron guy’s response when I asked him about a specific mixer: “You going to be buying today?” (With a bike helmet in my hand I had a ready excuse, but I would be buying in a day or two.) When asked about a high-output mic for just the situation that you describe here, he replies, “There is no such thing as higher-output mics” and said something about dynamic mics. Well, I know enough from reading Transom that that’s not right! The quest continues. For a decent mic and a decent pro audio shop. But it would be a whole lot more difficult without the sage advice here. I’m sure that salesman had some sort of very specific, fine-line distinction in mind about the exact technical meaning of certain words. I find it hard to imagine that he wouldn’t know that some mics need more boost from a preamp than others do. Maybe next time try the phrase “mic sensitivity” and see if that gets you anywhere! As mentioned above, as a general rule, condenser mics have a hotter output (higher sensitivity) than dynamic mics, but there’s a pretty wide variation within those ranges. Ideally, it would be great to try out some specific mics with the specific recorder you have, but stores are weird about that… they don’t like you returning microphones, but given that you actually have a brick-and-mortar store nearby, maybe they’ll let you try a few mics out while you’re there, if you bring your recorder with you? Worth a try… Good luck! Thanks for the considered response. I’ve spent the week looking for that elusive low price (<$200) handheld condenser mic – omni or cardiod – in the Los Angeles region, and to my amazement not one store has one in stock. I've tried 15 pro audio shops of every kind. Dynamic 'industry standards' (the 635 say) one can find, but the days of a fully-stocked shop are long gone. Even a mass-marketer like Guitar Center has nada. So comparison shopping is a non-starter. If you’re feeling lucky – the AT 8010 is a pretty nice-sounding condenser omni, and not much of a risk, at about $150. I totally agree that it would be better to be able to try it out, but it’s readily available on-line if you want to take a chance… There are examples of it in several of the audio record reviews, so you can hear basically what it sounds like… But I share your frustration about not being able to actually try things out in stores. Thanks, Jeff. Looking forward to your review. Just one point: it seems to me that the LS-100 indeed comes with a replaceable battery. True — it’s a custom rechargeable battery, but it seems to be swappable. It’s called Lithium Ion Rechargeable Battery (LI-50B) and can be purchased at http://www.olympusamerica.com/cpg_section/product.asp?product=1581&page=accessories . So, it’s not similar to iPhone in that its battery can be replaced though each LS-100 new battery costs about $44 — also add the cost of an extra charger to that. At any event, what I’ve found disappointing about the LS-100 is the noticeably high amount of noise its internal microphones generate. Cardioid microphones aren’t exactly famous for low noise, but one really expects better noise handling from a $400 recorder. That is, if it were, say, $250 I wouldn’t be so disappointed. In fact, I don’t think its internal mics are suitable for speech recording — they have excellent stereo separation but at the cost of a lot of noise which isn’t great for radio production at all. Just compare them with the mics on Sony PCM-M10 and the difference will be conspicuous. On the other hand, phantom-powered XLR mics such as the high-end Rode ones perform admirably when used with the LS-100, but that means the addition of a good $300 or $400 to our purchase. In short, do you confirm my findings about its internal microphones? 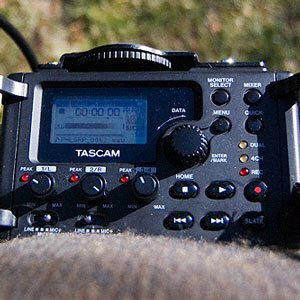 Do you think the Tascam DR-100mkII is a better purchase in terms of noise handling? Do you know if the Blue mikey works with the new Apple Iphone 5? If so what do you think of it. Any thoughts on the Zoom H2n and H4n? Great write-up Jeff. You nailed it! I went with the Tascam DR-05 for a budget priced field recorder. It’s not hands-free, but fits easily in my left hand with thumb free for controls. I find that its mic preamp. or whatever is quite inadequate for powering dynamic mics, M58 in particular, which seems to require more power than EVRE50 or EVRE635A. The M58 requires full record volume, which creates a bit of amp hiss. There is a mic power boost feature, but instructions say it can damage dynamic mics and it doesn’t seem to make any difference in the amplification anyway. It seems my only better option is a machine with a better pre-amp. Maybe more expensive Tascams have better mic preamps, but big, clunky and over-priced doesn’t work for me. Regarding studio mics, I would be most interested to hear about less expensive dynamic studio mics that sound as good as the RE20. Rode Procaster? – – To Mark, B&H in NYC has competitive prices on a wide range of field equipment, and reliable delivery. Also try BSW. I have ordered from both and was satisfied (expect sales people to try to sell you more than you planned to buy). Hey Scott, I have a similar experience with the Tascam DR-100, which costs three times as much as the 05. I was looking to replace my Marantz, which was stolen, and the guy at B&H in NY was really pushing this model, so I went for it. It hates my dynamic mic, but if you turn up the mic gain, you get a horrible hiss. I agree – have gotten good service (and prices) from both B&H and BSW. I’m on a serious budget. I’ve got a sony minidisc recorder from when I did a radio series in 2005. I like it, but it won’t talk to my Mac. I used a Toshiba laptop before, but it is long gone. I mix with a Sony MRS-4, also retro by today’s standards, but still good. Got condenser mic and all that. What I need is a super light, small computer (I live on a boat) that will pick up the internet, use all of PRX tools for conversion and whatnot, and play nice with the Sony products. What can you suggest in this wild world of tech? I also bought a DR-05 but use my Sound Devices 302 mixer’s tape out to send the audio into the DR-05 and can do it with the DR-05 volume controls turned all the way down. So the 302 is the pre-amp and it sounds great. The mix pre also can be used. Marantz have updated their audio recorders. Now they’re offering PMD620 MKII and PMD660 MKII. Apart from the features they tout as new, do you know if they provide any enhancements when it comes to their internal mikes? I really want to get a PMD620 MKII, but if the internal mikes are as noisy as the older PMD620, that would be a no-go. BTW, Jeff, I’m sure many people are still awaiting your Olympus LS-100 and Tascam DR-100MKII reviews! Your help would be quite appreciated. I have a Beyerdynamic M58 thats over ten years old now. I’ve decided to dig it out and use it again instead of the condenser mic I’ve been using recently. I can’t remember if there was a battery in it. I vaguely remember there was. Can anyone help? The Beyer M58 does NOT have a battery compartment, it’s a dynamic mic, and does not need phantom power. Just make sure you don’t have the Beyer MCE-58, that model, with the E in the name, does have a battery compartment in it, and needs either that battery or phantom power from the recorder. Another thing to keep in mind: the dynamic M58 is a terrific mic, but it has a pretty low output, so you can end up with hissy sound on some of the cheaper, small recorders. The Sony PCM-M10 and PCM-D50 pair will with that mic, they give it enough clean gain that the low output is not a problem. The Tascam DR-100mkII should be fine, and the Marantz PMD 661 too, but you’ll get lots of noise with the original Tascam DR-100 or the Marantz PMD-660. The MCE-58 will be fine with almost any recorder. Good luck! That’s really great, thanks for posting it! In any case, it’s great to have an independent comparison of the relative quality of mic preamps, it’s one important aspect to keep in mind – maybe the most important! Hello Jeff. I want to get a good dynamic microphone for my Olympus LS-100. Do you recommend the EV Re50? Can LS-100’s preamps properly support it? I very much like the Re50 but as it’s a dynamic mic, I’m not sure if I’m getting the best microphone for the LS-100. Curious, have any of these recommendations changed since publishing this article? Particularly with recorders, how would you stack up the Zoom H6 or H5? Advice please! Im starting a podcast, they will just be one on one interviews. I will need to go to be mobile, though I hope to be mostly recording inside. Im not rich, but i would love to give the interviewees the best sound to their voice that I can reasonably afford to. Could anyone please recommend what gear would work for this? I would be so grateful for any advice, I don’t understand the terminology of all this so just needed to be pointed in ‘a’ right direction. hey Jeff – I’m producing a podcast and want to give my sources a good hand held recorder to do their own recording with at home. NON BROADCAST folks and one is autistic. I LOVE LOVE my Zoom HN4 (recommended by you a few years back at some conference/wkshop) but I don’t think I need to get them something that sophisticated. What would you recommend? It’s for first person, individual reflections, family meetings between 3 or 4 people, recording in the car, etc. In other words, multi purpose.